The best buys in binoculars today are in the mid-priced $300 to $700 range. A new generation of binoculars is only a hair's breadth below the quality of the most expensive optics you can buy. Of course who wouldn't love to have one of the top birding binoculars? (Swarovski EL, Nikon Premier LX, Zeiss Victory FL, Leica Ultravid, for example.) They are marvels of optical sharpness and brilliance. But if your bank account isn't in the mood to lay out $1300 to $1900 for a binocular, don't be discouraged. You can get something that is almost as good for 1/3 the price, or less. Well, in recent years, manufacturers have moved fast to make binoculars to meet the growing demands of birders. Many of the secret processes and coatings are now available to all. And as a result, the quality gap between the most expensive binoculars and the mid-priced ones has shrunk. In fact, some of the new mid-priced binoculars are just as good as the most expensive were just a few years ago. All of these features were premium items a dozen years ago. Now they're almost standard in good quality binoculars, at moderate prices. 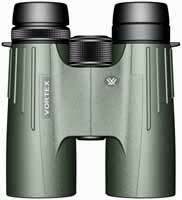 The Vortex Viper is an outstanding example of this new trend in binoculars. We tested it against binoculars costing twice as much and more, and it scored so close that we think no one would ever feel sorry for buying one. And if you ever do move up to a celebrity-priced binocular, your Vortex Viper will still be great to have as a second binocular, to keep in your car or cabin. Or to lend to a (very good) friend who wants to go birding with you to find out what it's all about. The Viper is bright, sharp, and neatly made. The focus knob turns smoothly, and you can feel the careful craftsmanship and engineering that went into it. Rubber armored, it seems solid enough for rugged outdoor use, and yet it weighs only 22.7, making it a lightweight. Although you might not have heard of Vortex before, we can tell you from our experience with the company that the people who run it are the kind of people we like to do business with. They produce better quality optics than you would expect for the price. They are more than fair to customers, and they give superlative warranty service. And one more thing: they keep their word. We don't know any other binocular on the market of comparable price that is as good.